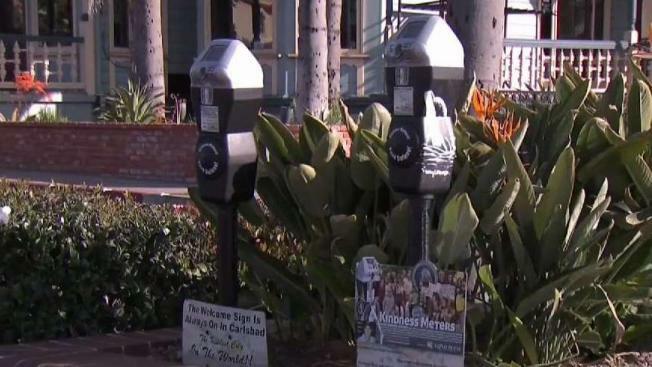 There are no regular parking meters in Carlsbad yet residents seem happy to be dropping their spare change in a meter of a different kind. The "kindness meters" are part of one man's mission to spread kindness. It has been a labor of love for longtime Carlsbad resident, Carlton Lund, who spent 15 years working to get the meters up and running in his city. Kindness meters look just like regular parking meters but the money collected, either through coins or by credit card, goes to local charities. There are two meters along the heavily trafficked Carlsbad Boulevard. All the money put into the meter on the right is split between seven different charities, the main being the Carlsbad Charitable Foundation. The meter on the left raises funds to light the sprawling "Carlsbad" sign that hangs over the city's main intersection. "Every time someone puts a quarter in, that’s an act of kindness," Lund said. "So I don’t want to talk money, but there have been thousands of acts of kindness over the last few years and the person that gives actually gets as much benefit as the person who receives." Lund's Kindness Meters Project has already helped install a dozen meters across North County San Diego and one in Hillcrest. Visit here to find a kindness meter in your area. Lund’s next goal is to make an addition to the Carlsbad sign. He's working to raise enough money to adorn the sign with American Flags on each holiday.